The story of my chemical romance. The first time I drank Four Loko, I woke up the next morning with a shot glass in my pocket, electrical tape on my foot, and half a sandwich in my bed. The last time I drank Four Loko, I challenged a roomful of complete strangers to a Jell-O wrestling match. In between, I've done plenty of ill-advised things under the influence of Loko, some of which I can even remember: I've climbed trees, been ejected from bars, and, once, decided that shoes were "too constrictive" and that it was a good idea to spend the better part of a night walking around barefoot — in New England, in March. People who decide what's a trend and what's not will probably tell you that 2010 was the year of the alcoholic energy drink, and it certainly was for me. The life and death of Loko has been the singular focus of more scrutiny than nearly any other product in my memory, not to mention provoking more news stories, protests and counter-protests, and general zeitgeisty chatter than, like, three-quarters of the things Obama has done as president. For those that've somehow missed all this, Loko — a sickly sweet, super-alcoholic, highly caffeinated canned malt liquor — is better known as Loke, Blackout in a Can, or Liquid Cocaine, in the words of one particularly descriptive Delaware cop (whom I'm willing to bet has never tried either, because if he did he might realize that one is malt liquor and one is a Schedule II narcotic.) It contains as much caffeine as a large cup of coffee and as much alcohol as five beers, and yet still manages to taste like nothing but Jolly Ranchers. Loko is both nothing new and completely unprecedented: Human beings have, after all, been combining alcohol and caffeine since basically the beginning of time, in the form of Irish coffee, Jack and Coke, Red Bull and vodka, and so many others. But never has this combination been marketed so transparently to young people — theoretically the most inexperienced drinkers and the most susceptible to poor decision-making — and never has a drink promised, so obviously and in such certain terms, to get you fucked up. As someone who — believe it or not — used be get paid to teach college students how to drink responsibly, I'm well aware of the risks. In a nutshell: Stimulants trick your body into thinking you're less drunk than you are, which in turn prompts you to drink more than you might otherwise. Loko is insidious in that it's liquor that doesn't taste, smell, look, or feel like liquor. And that's dangerous. But it's dangerous in the way that drinking anything alcoholic — or, for that matter, driving a car or living in a city or owning an oven — is dangerous, which is to say it's only dangerous if you're incredibly reckless, completely unaware of yourself and your surroundings, or extremely unlucky. I've done plenty of stupid things after drinking Four Loko, but I also once managed to hit myself in the face with a bowling ball while completely sober, so you never know. Like John Lennon or Polaroid film or Cody's Books, dying was, in a backwards way, the best thing that ever happened to Four Loko: Crackdowns, first on the state level and now at the federal level, have turned what was once just another relatively nasty-tasting alcoholic beverage into something much more. The Loko ban has inspired countless Facebook groups and more than a few YouTube videos and songs; a rally and vigil last month in New York City's Union Square apparently drew hundreds of people. Loko has come to embody a specific moment in time the way I imagine 40s did for the generation before mine; turned, somehow, into a folksy symbol of rebellion for a generation and a demographic that are often derided for not caring about anything. In this sense, it's the ultimate hipster cause, because it's not really about a cause other than getting drunk. I first got into Loko the way I imagine most people do — in college, when anything involving alcohol seems like a really good idea. It started as sort of a hipster joke and quickly ripened into something realer and deeper as my friends and I came to understand just how awesome it is to be both incredibly drunk and completely wide awake at the same time: Loko is one-stop shopping, and I'm a gal on the go. When Loko was banned, I promptly bought out my local liquor store. My stockpile is slowly being whittled down, and soon I'll be left with only the Blue Raspberry flavor: desperate times, indeed. I know sometime sooner or later I'll finally be done, and I'm starting to become okay with that. Loved and lost, and all that. In the meantime, I'm appreciating the little things: The oddly camouflaged packaging, the cloying and subtly aluminum smell, the quaint little "we ID," despite the fact that a) an aluminum can can't do much of anything, and b) if whoever "they" are did ID, we probably wouldn't be in quite this mess now. I'm trying to relish for the last time the particular sense of invincibility that comes with having in my hand a can the size of my forearm filled with three different stimulants, 12 percent ABV malt liquor, and of course, Red #40. 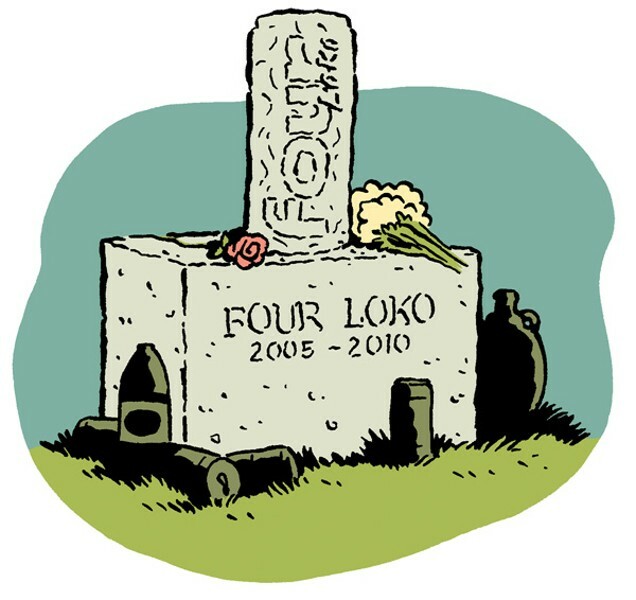 Loko, we hardly knew ye. Some activists contend that a new California law banning caffeinated beer and malt liquor didn't go far enough.